John admits that the description is not his own. It is a “message” he and the other disciples had “heard from him,” meaning Christ. Who better to describe God to man than the God/man Jesus? There is a very good reason Jesus is called “the Word.” (1 John 1:1) Christ is the ultimate communication of God to man and, according to 1 Timothy 2:5, He also facilitates the communication of man to God. Within the Divine word picture, “God is light,” we find a reference point often used in Scripture to help readers locate God. Light represents that which is good, pure, and holy. On the other hand, darkness represents that which is bad, corrupt, and unholy. To find God, we must go toward the light. 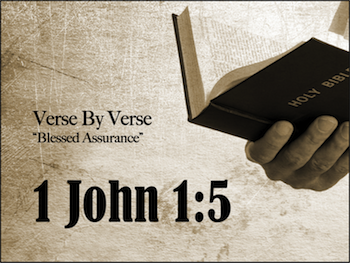 For assurance to be sure, we must let God speak for Himself. We must be true to the inspired context. After each study, read the entire chapter again taking note to the way today's verse relates to all the verses around it. Due to the colorful, complex nature of the original language, the best translation is multiple translations. Following each lesson, this chapter will be presented in a different translation. Below, we have featured the New American Bible (Revised Edition). Now this is the message that we have heard from him and proclaim to you: God is light, and in him there is no darkness at all. If we say, “We have fellowship with him,” while we continue to walk in darkness, we lie and do not act in truth. But if we walk in the light as he is in the light, then we have fellowship with one another, and the blood of his Son Jesus cleanses us from all sin. If we say, “We are without sin,” we deceive ourselves, and the truth is not in us. If we acknowledge our sins, he is faithful and just and will forgive our sins and cleanse us from every wrongdoing. If we say, “We have not sinned,” we make him a liar, and his word is not in us. Missed the first five parts of this study? Check them out! Back to Top of "God is Light"